To increase a plant by layering, peg down the shoot of a garden plant at ground level or bury it in the soil, to encourage it to produce roots while still attached to the parent plant. Sometimes this method is used in bonsai, but the parent plant must be multi-trunked, and be growing in open ground. The technique more frequently used for bonsai is air layering, a very quick way of producing a bonsai, because you can first choose a well-shaped branch that can be pruned into a suitable bonsai shape. 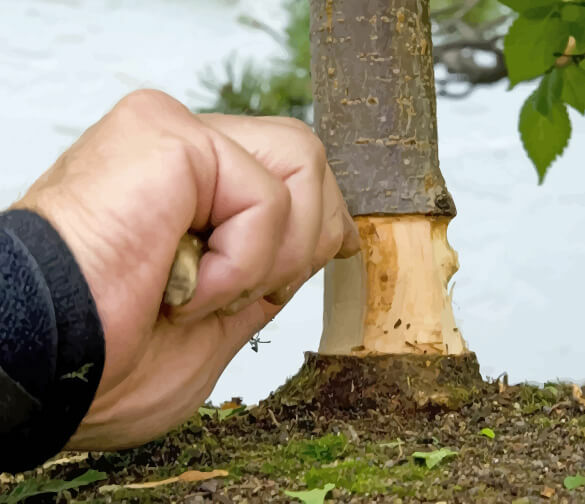 Commercial growers usually propagate trees and shrubs by grafting, but this process is more difficult for beginners or amateur gardeners to master, and only the basic principles of grafting are explained here. Propagation is a fascinating subject, and there are many books devoted solely to giving information on all possible methods. In the usual method of air layering, sphagnum moss is wrapped around the stem, and covered with clear plastic to make a “parcel”. The roots will grow out from the stem into the moss. In this case, however, a pot of soil was used instead of the moss. This method has the advantage that, after the roots have developed, you can sever the stem at the base of the pot and thus avoid disturbance of the tree by repotting it. Using a sharp knife, make two encircling cuts in the bark, spaced at a distance of one and a half times the stem diameter. Remove the bark between the cuts. Cut a plastic pot down the side and halfway across the bottom toward the center. Trim to fit around the trunk and position, preferably supported by branches. Close the pot back together again and secure with wire. Fill the pot with some of the same free-draining soil mixture that is used for cuttings. You can use air layering to improve a tree's appearance. This flowering hawthorn is the same type as the hawthorn shown opposite. It was originally a grafted plant, but . Air layering can eliminate some faults (e.g. a clumsy graft above soil level that resulted in a disfigured trunk) by stimulating new roots to grow above the graft, so that the tree can be repotted. This is done by enclosing the lower trunk in a pot of soil. After a suitable period of time, the pot can be temporarily removed to monitor how the roots are developing. It can then be fitted back around the rootball and the wires replaced. Once a new root system has developed satisfactorily above the graft, the original rootstock can be removed, whenever the tree is not flowering. The air layered tree is grown on, with the new root system above the original soil level. The tree can be repotted in early spring before the new leaves open from the buds. The propagation technique of grafting is especially appropriate for certain species, such as pines. Fruiting trees are frequently grafted, because a tree grown from seed will need many year's growth before it is sufficiently mature to produce flowers and fruit; it takes crab apples (Malus) 15-20 years to do so. Also, crab apples grown from seed seldom resemble their parent plant, and may have unattractive flowers and fruit. A grafted tree will always come true to type, and will produce plenty of flowers and fruits. The part of the tree that is grafted on to the rootstock is called the scion. To make sure the graft will “take”, you must align the cambium layers (the green layers just under the bark) of the scion and the rootstock. Here, a crab apple seedling that is two years old is used as a rootstock for a mature crab apple scion. Graft it in late winter or early spring, and the scion's flower buds will open three months later. If you plan to do much grafting, it would be useful to read a specialist book that gives advice on practical details and on suitable rootstocks for species you plan to grow. Make a clean cut across the stock, then split down the stem, using a sharp blade. Next, carefully fit the scion into the split stem. Bind the graft firmly with clear plastic tape, from the uncut part of the stock to the scion's upper stem. Remove the tape after a year.